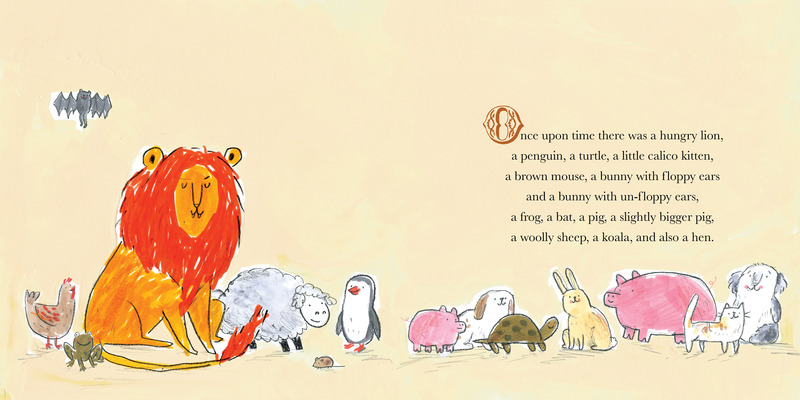 A Hungry Lion or A Dwindling Assortment of Animals by Lucy Ruth Cummins (2016). I don’t want to say too much about this book because it’s full of surprises. But I think it’s safe to say it’s mischievous, brave, and oh so much fun! 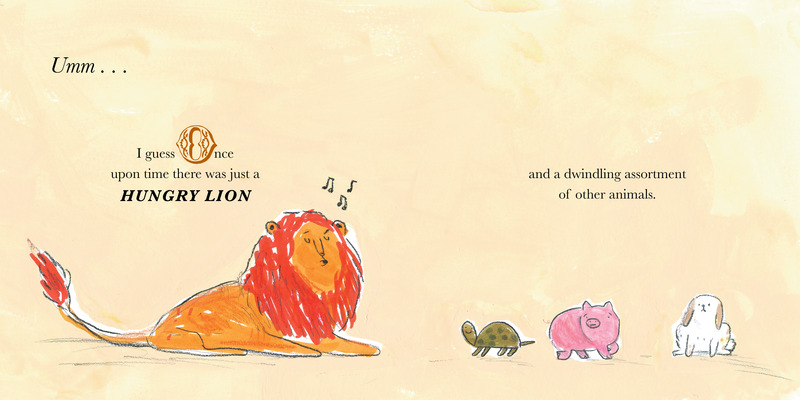 A Hungry Lion plays with our assumptions, with page turns, with wordless or nearly wordless spreads, and with a spunky narrator. And then it turns everything on its head. Possibly more than once. The beginning spreads set up a pattern. There’s an assortment of animals. And it’s dwindling. We can all imagine who the culprit is. Just look at his fangs! His angry orange mane! Look how he hums, innocently, but how pig looks quite nervous nonetheless. But need she be? That is the question this book asks. One of them anyway. Here’s a surprise I referred to! 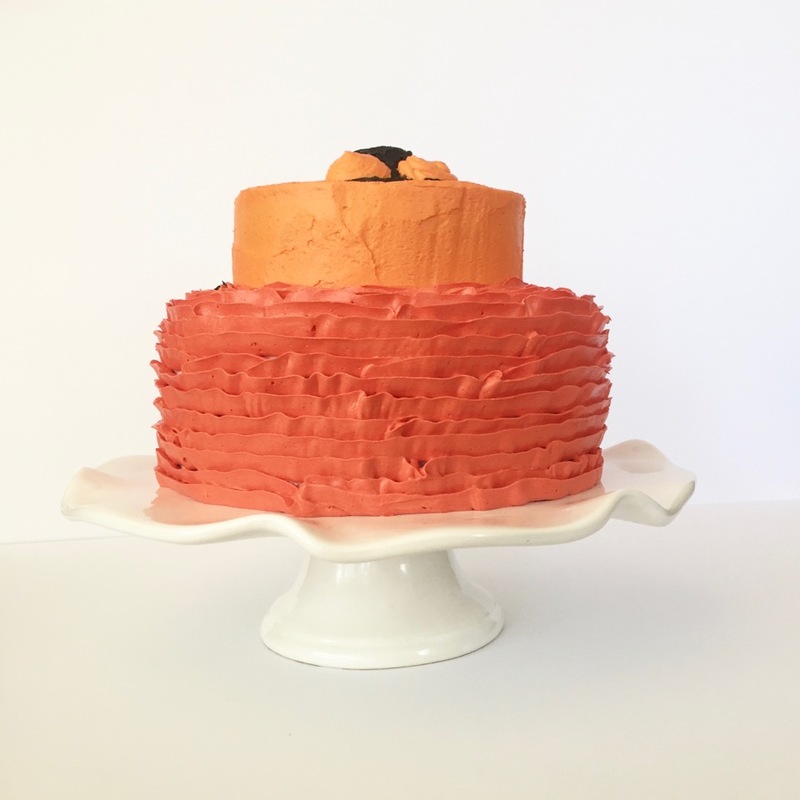 A cake and party surprise, one of the best kinds! Oh, but the story doesn’t end there. Not at all. There are more surprises in store, along with an answer to the question of who’s king of the animal kingdom after all. It might have less to do with fangs and an angry orange mane than was first assumed. 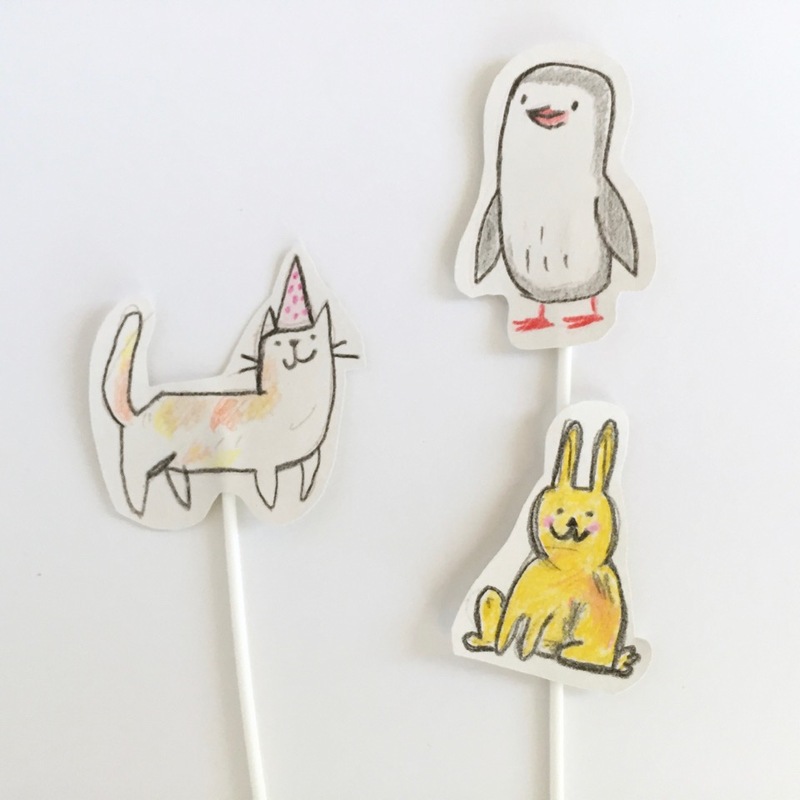 Those dwindling animals as cake toppers immediately came to mind for this picture book craft. 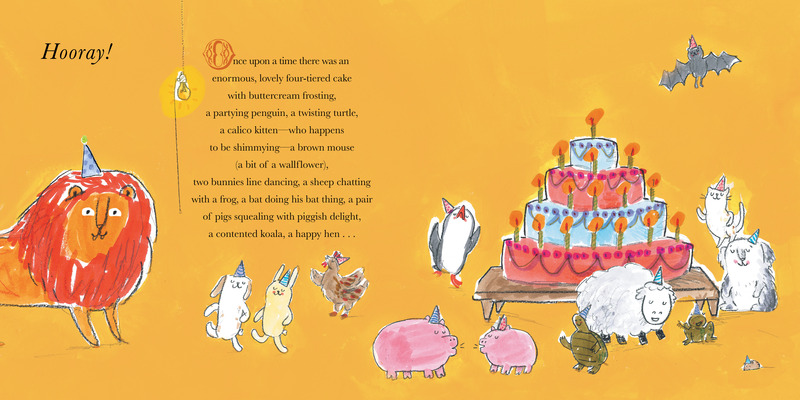 There’s even a cake in the book itself! So, cake it had to be. 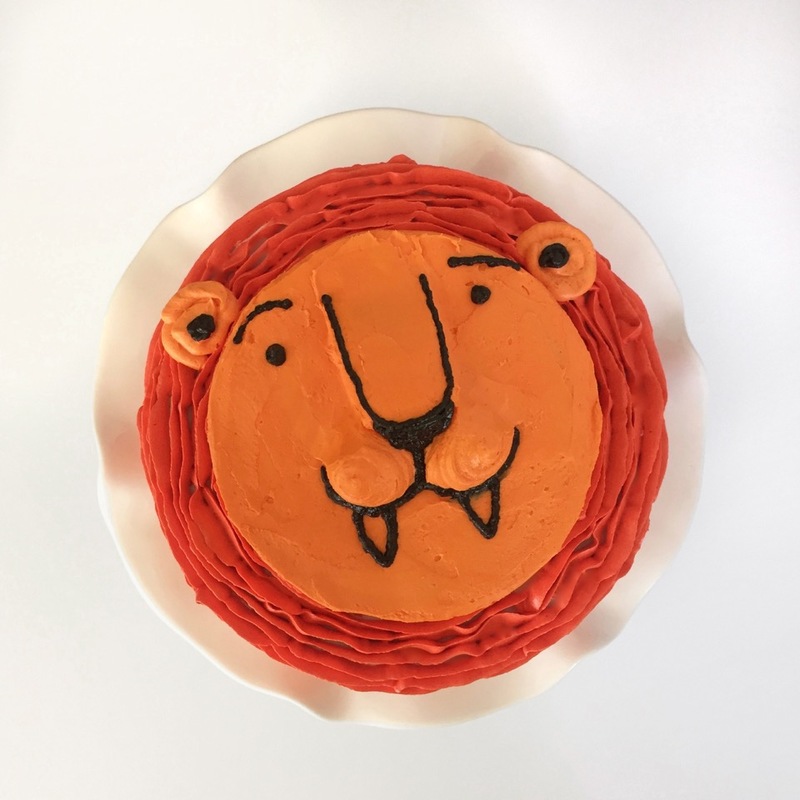 As such, I enlisted the help of my dude, Todd Davis, to whip up a lion cake with a ribbony mane. Because he’s the guy to ask for stuff like that. Come see what we made! 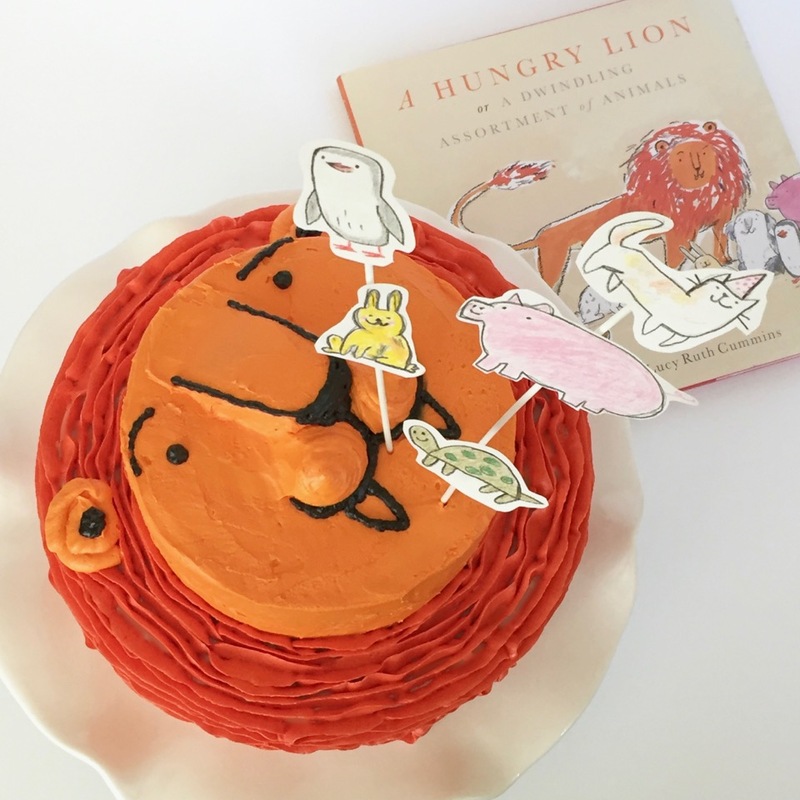 That’s a hungry lion cake. And that’s a dwindling assortment of animal cake toppers. A cake! If you make it like we did, you can go homemade or boxed in terms of cake and frosting. For eating, buttercream is best (and mentioned in the book). We used three cake layers for the base/mane, and one layer for the face. 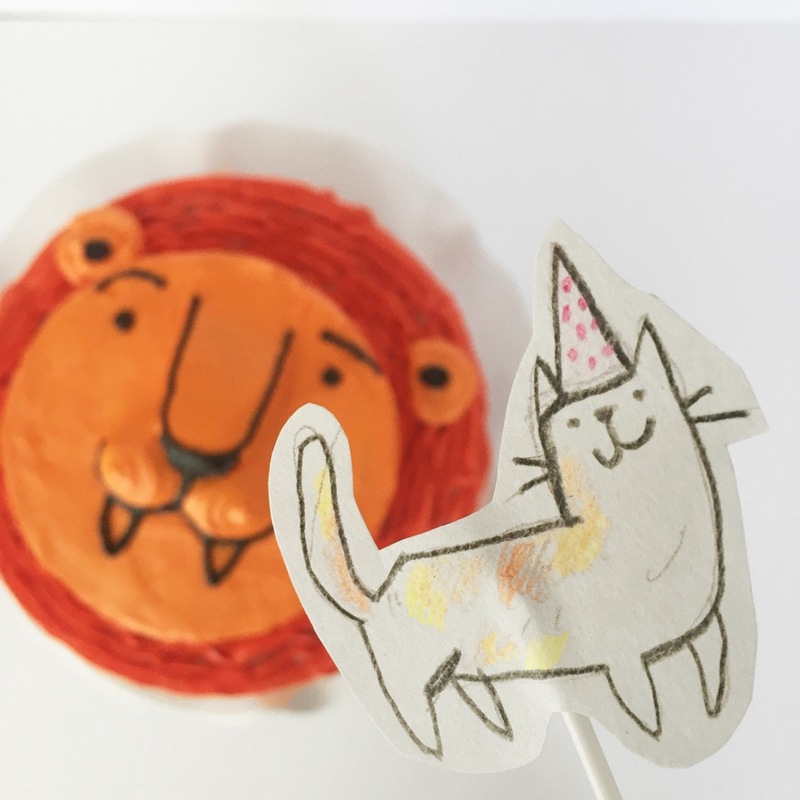 We made our animal cake toppers first. 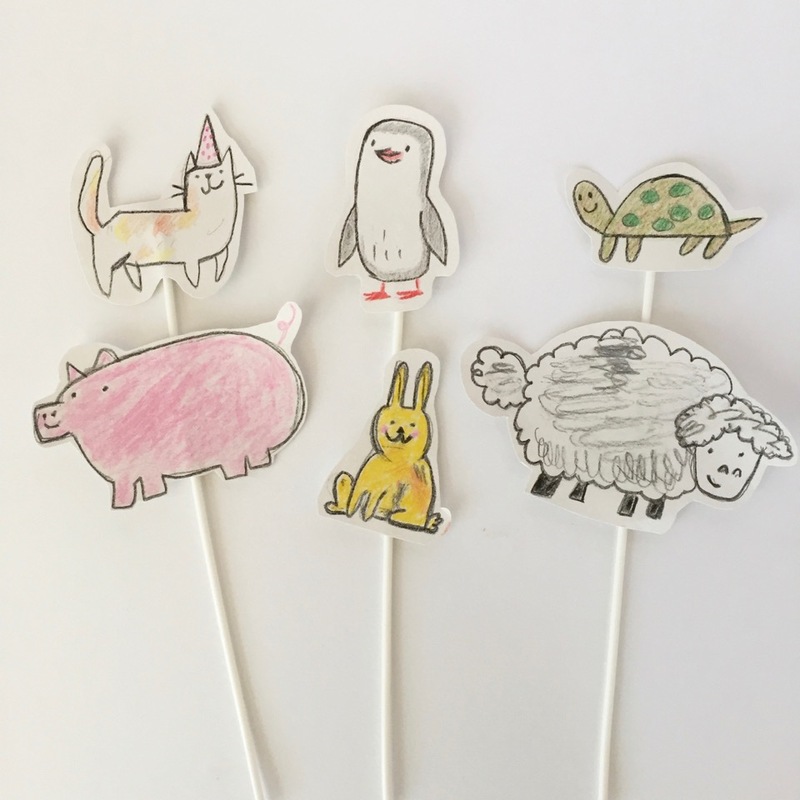 We eyeballed the animals in the book to draw them, colored them in, and cut them out imprecisely. 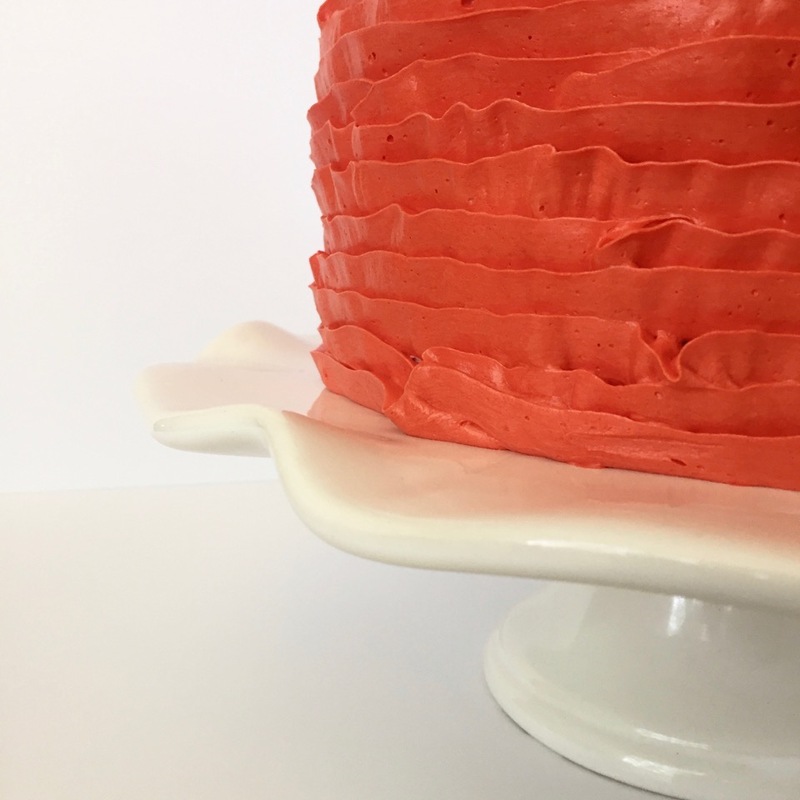 We taped one or two to each slender cake candle, and done! This is a great thing to do while your cakes bake. And when you’re ready, mix your food coloring with frosting (it takes a lot of red to make that deeper orange) in three separate bowls (two oranges and one black for face details). Frost between layers and stack them, then frost the entire surface area. Next, decorate, face first! Frost with orange and add features. Play! Our nose is made from part of that extra small cake we made and set on the face. But you can do it however you like. For the mane, Todd used a 104 petal decorating tip and went around and around with it making a thick squiggly line. 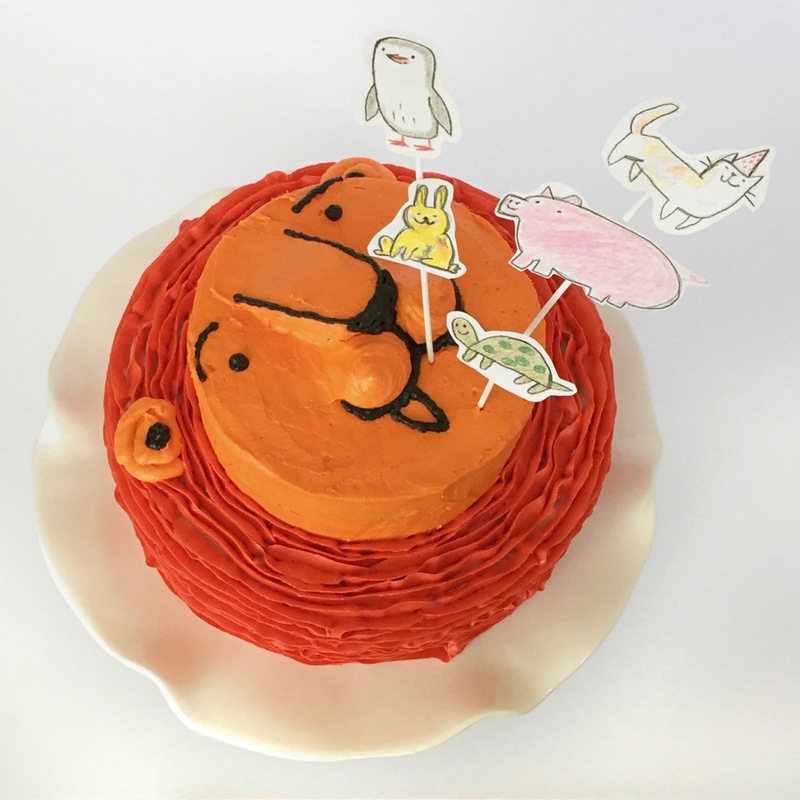 You won’t be hungry after eating this cake! And you will be satisfied after reading this book, making this craft, or both. Huge thanks again to Todd Davis of Davis Handmade (my husband)! 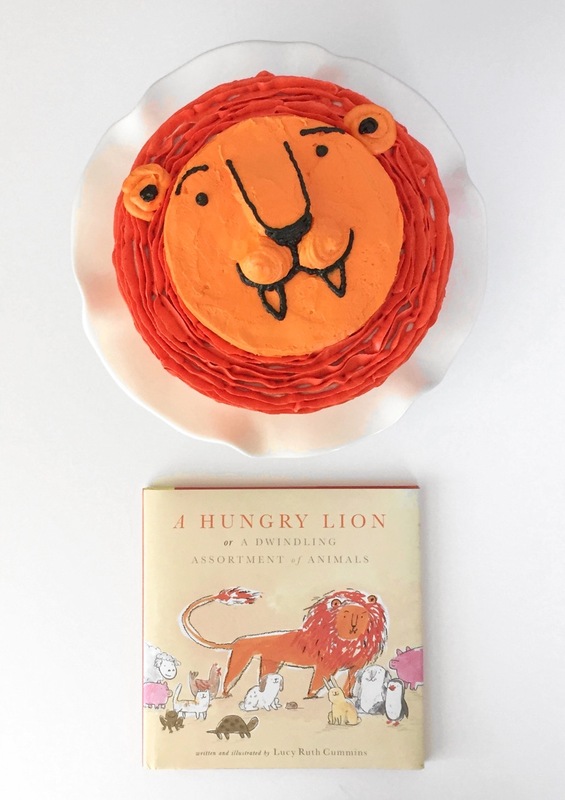 read the book, make a lion cake and cake toppers! Just recently read, and re-read, and loved this! 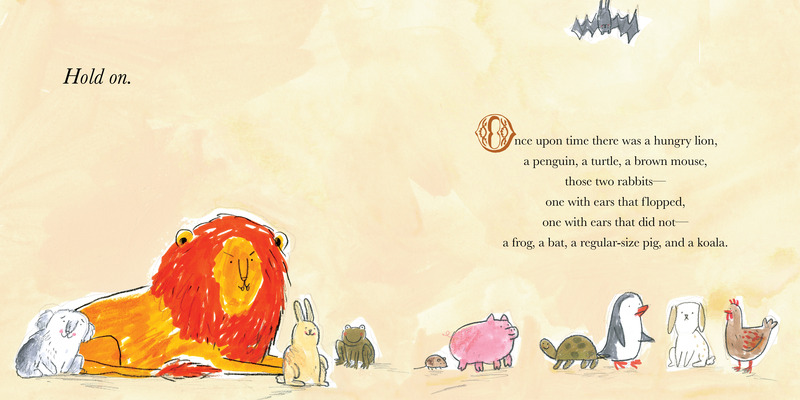 Such a fun story with adorable illustrations. It takes the cake ;). Thanks, Danielle! Can’t wait to get my hands on this one! Thanks for the great review! I hope you do and I hope you eat it up. Hahaha. I love this book! Great post and ideas! A great study in page turn How To THRILLER. LOVE it!